How would any of you describe the Holy Trinity? One time I was having a discussion with an atheist who had popped in the comment section of my blog who presented a challenge to all Christians. The challenge stated, “Name one unique idea created by Christianity.” After some other bloggers had offered ideas that were dismissed, and after I had presented Transubstantiation— only to be dismissed (even though it is unique)— I also presented the most glaring central doctrine of the Church, The Holy Trinity. However, the atheist rejected this as not being an original idea as he gave what he referred to as the Hindu trinity known as Trimurti. After I had looked into the Trimurti, I concluded that the Christian Trinity is truly unique, and this comparison to the Trimurti was a false equivalent. During the conversation, I wish that I had the modern example given by Michael Pennock in This is Our Faith of a woman who is three different persons, although she is one woman. She is a Mother, a wife, and friend. I also wish I was more familiar with St. John’s of Damascus example, “The Father is the sun with the Son as ray and the Holy Spirit as heat.” All very distinct concepts, but from one source, and with one will. It is entirely different, a central doctrine and great mystery that is truly original to Christianity. Dave Armstrong, Quotable Newman (Sophia Press: Manchester, 2012), 197. The Fathers at Nicaea were concerned primarily with Christology, which was the focus of the dispute with Arius and the Arians. In all this discussion of the relationship between Father and Son, less attention was given to the Third Person of the Trinity, the Holy Spirit. For clarification on this subject – pneumatology – we owe much to the Cappadocian Fathers, especially St. Basil and St. Gregory Nazianzus. It was their achievement to show that the Spirit, too, was of the same Substance as the Father and the Son; their greatest achievement was to make sense of the One-ness and the Three-ness of the Trinity. 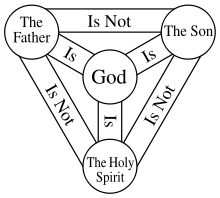 The Trinity was of the same Substance: the Father was God, the Son was God and the Holy Spirit was God – but the Father was not the Son, neither was either of those two Persons the Holy Spirit, although they are what the Father is in Substance. They came up with the word hypostasis to express the difference. The Son and the Spirit are what the Father is (God) but they are not who the Father is. They relate to each other as Persons in a communion of love which is not to be explained. The relationship between Father and Son is that the former begets the latter. This mode of eternal filial origination is the distinct hypostatic character of the Son – His Sonship lies in that He is begotten of the Father (before all worlds, God of God, True light of True light, begotten not made). The Spirt issues perennially from the Father, and this mode of eternal spiration is the distinct hypostatic character of the Spirit, who, however, proceeds from the Father through the Son. The Spirit’s mode of origin – spiration, is what distinguishes the Third Person of the Trinity from the Second. So, all Three Persons are God, but each in a distinct, hypostatic realisation. The Divine Nature is not a common property of three different entities, it is, as St. Gregory showed, a personal being (that of the Father) that is hypostatically realised by the Son and the Spirit as they each derive from and relate back to the Father. The Father is the dynamic cause of the Trinity – Three Persons, One Substance. Just as the beauty and the greatness of the heavens is one; the infinite conjunction of Three Infinite Ones, Each God when considered in Himself; as the Father so the Son, as the Son so the Holy Ghost; the Three One God when contemplated together; Each God because Consubstantial; One God because of the Monarchia. St. Gregory himself, rightly warns us that to engage too much in theological reflection led to the danger of dazzling the mind by speaking about mysteries that even the angels cannot comprehend. Although Nicaea gave us the basis of the Creed which bears its name, it failed to say much about the Holy Spirit. It was left to St. Basil and St. Gregory Nazianzus to show that the Spirit, too, was of the same Substance as the Father and the Son. Their greatest achievement, however, was to make sense of the One-ness and the Three-ness of the Trinity. St. Gregory himself, rightly warns us that to engage too much in theological reflection led to the danger of dazzling the mind by speaking about mysteries that even the angels cannot comprehend. After that little excursion – something upon which we can all agree. Sometimes commentators ask why Bosco is not banned? There is a simple answer, which is that I care about his immortal soul and the souls of others, and what he, and they confess, when they say they need no religion, just a simple walk with Christ, is a commonly held position. After all, one might reasonably ask, “why does all this stuff about the Trinity matter anyway, can’t I be a Christian without an advanced degree in theology – and anyway, no one really understands it?” The answer is that we are not the first to encounter Christ, and that those who walked the earth with Him thought it vital that the tradition they passed on be held by all followers; St Paul did not merely receive a revelation and declare himself authorised to teach as he liked. What applies to Paul applies to all of us. Christians have known that orthodox belief matters because it defines, as far as we can, who Christ is – and if we fail to grasp that, we can’t have any sort of relationship with Him. The New Testament talks much about Father and Son, and about the Holy Ghost, but as the last post outlined, understanding the relationship between between the three was a problem. Christians, after all, were Monotheists – believers in One God – and yet their sacred scriptures and their tradition seemed to contain three entities. By the fourth century it was clear that the notion that this did not mean One God acting three parts – it would make no sort of sense, even as a deep mystery, to have Jesus praying to Himself at Gethsemane, or asking Himself to let the cup pass Him by. But the nature of the relationship between Father and Son (at this point little attention had been paid to the Holy Spirit) was thrown into question by an Alexandrian priest, Arius. Quoting John 17:3 , along with Colossians 1:15 and Proverbs 8:22 he argued that the Son was not God, but the first-born of creation – a creature, not the Creator. His bishop, Alexander, condemned him, but, as is so often the way, Arius quoted these lines of Scripture and argued that there was a ‘time when the Son was not’, defying his bishop to do anything about it. Arius was not the first, and will not be the last, clever man to think himself illuminated in a way denied to lesser intellects. Arius posed a problem for Bishop Alexander, and so popular was his reading of Scripture, that it soon posed a problem for Bishops elsewhere. What the confrontation with Arius did was to force men who had not thought through the beliefs they confessed to do so. So what was it the Bishops held? They held that Jesus was God, in the beginning with God – a notion to make the head spin, but one which accorded with John’s Gospel and which made sense of Jesus being Divine. But Jesus was also human, so how could He be both? The Arians argued that this made no sense, and that they were more logical – Jesus was a created being sent by God to create the world and redeem mankind – but He was not God, as there was only One God. This was easily comprehensible by everyone – hence its popularity. In order to combat this heresy, orthodox theologians, the most eminent of them being a deacon of Alexander’s, Athanasius (who succeeded him as Patriarch of Alexandria), were forced to think through how God could be both One and Three. The notion that God existed in three modes, Father, Son and Holy Spirit, was a common one, but did that mean that Jesus and the Holy Spirit were somehow less than the Father? Athanasius argued that He existed in Three Persons, that Father, Son and Holy Spirit were equal and yet one. The word he used to express this concept was the Greek homoousios – that expressed the view that the Son was of “one substance” with the Father. It was from this formula that the Nicene Creed developed in 325. So, God was Father, the Generator of all things, but Himself ungenerate (that is He was before, above and beyond our concepts of Time), and Jesus was generated of the Father ‘before all worlds’. The manner in which this has happened was a mystery beyond our comprehension, but it firmly established that Father and Son, and also Holy Spirit, were of the same substance (consubstantial) and therefore both one and three – for which the new word, Trinity, was coined. The Council of Nicaea in 325 established this as Christian orthodox belief. But, as Athanasius himself was aware, the place of the Holy Spirit in this triad whilst established, had hardly been discussed. This will be the subject of the final part of this series. In researching this morning’s Patristic commentary on Galatians, I cam across St Augustine’s comment that we ‘obey the law spiritually when we act out of love, not fear’, and his reminder that the law is there for our good too. That took me back to some of the recent discussions here about ‘love’ and ‘the law’ where, at times, one might have gained the impression that they were somehow antithetical. It can, it is true, seem that way. Newman described well the type of Christian who is so worried about ‘Judgement’ that he never shares the joy of knowing Christ, so conscious of his sins that he appears to derive no joy from knowing Christ. One of the things often commented upon by anti-Christian polemicists is just that tendency to be concerned with judging others which can come from judging ourselves. Jesus Himself asked how we could love God, whom we did not know, if we did not love our brother whom we did? If we hate ourself, how can we love others? What, after all, is love, save that which emanates from the mystery of the Economy of the Trinity? The most startling insight of Christianity is not the revelation that God is one, but that He is Three. The Jews, and now the Muslims, hold the first belief; Christians alone hold the latter. When St. John tells us that ‘God is love’, he describes the relationship of the Persons of the Holy Trinity. …the “three persons” who exist in God are the reality of word and love in their attachment to each other. They are not substances, personalities in the modern sense, but the relatedness whose pure actuality… does not impair unity of the highest being but fills it out. St Augustine once enshrined this idea in the following formula: “He is not called Father with reference to himself but only in relation to the Son; seen by himself he is simply God.” Here the decisive point comes beautifully to light. “Father” is purely a concept of relationship. Only in being-for the other is he Father; in his own being-in-himself he is simply God. Person is the pure relation of being related, nothing else. Relationship is not something extra added to the person, as it is with us; it only exists at all as relatedness. ….the First Person [the Father] does not beget the Son in the sense of the act of begetting coming on top of the finished Person; it is the act of begetting, of giving oneself, of streaming forth. It is identical with the act of giving. In short, each of the persons of the Trinity lives completely for the others; each is a complete gift of self to the others. The complete self-giving not only constitutes the individual persons of the Trinity, but also their inseparable oneness. That love, it was which impelled him to take action to help his creatures gone astray so when the time had fully come, God sent forth his Son, born of woman to redeem us and make us sons by adoption. It is the love that overflows from the Trinity which created the universe and ourselves, it is that love which offers us redemption, and it is that same love which also sets out the law to help us. We obey the law because of love, not fear, but that does mean the law does not matter or is somehow opposed to love. Here Jesus tells his disciples that there are some things they are not ready to hear now, but they will hear them from the Spirit once he had ascended. Since the Spirit proceeds from the Father through the Son, He can grasp what no more human can, and we are bound to give assent to Him, even if we cannot fully understand – it is like Our Lord and Nicodemus, when the latter wondered how a man could be born again. In our regeneration we receive faith, but perfect understanding is not ours. The Spirit, Hilary of Poitiers reminds us, listeth where He will, and He is not beholden to us or required to explain himself. So, in the words of the Creed, we confess we believe in the Father, Son and the Holy Spirit, and we hold firm in that faith. The Infinite is not to be understood fully by the finite, and if we think we fully understand it, then it is not the Infinite Mystery of the Trinity which we grasp but a phantasm of our own devising. One of those things which the disciple grasped when the Spirit came was that the Spirit was Divine. (St Gregory of Nazianzus). We are, St Augustine reminds us, to grow in all love, that love which is nurtured in our hearts by the Holy Spirit. It is through the workings of the Spirit that our understanding will become spiritual and surpass the carnal understanding of men. In this life we shall not enter into all truth, but we can be prepared for it. Now we can know only in part, as through a glass darkly, but hereafter we shall know as we are fully known, and we shall see Him face to face. This is what the Lord means when he tells us that the Spirit will guide us into all truth. St Ambrose comments that the Spirit speaks in the name of the Father and the Son, because they are one God. What the Son said was from the Father, and what the Spirit says is,.likewise from the Father and Son. The Son is biorn of the father, and the Holy Spirit proceeds from the Father, but only the Father, St Augustine reminds us, is ‘not of another’. But we should not therefore think there is any disparity in the Trinity, for the Son and the Spirit are equally one God with the Father. The distinction is that the Son is born of the Father and the Spirit proceeds from the Father through the Son, but that does not make any difference between them as to substance, for they are consubstantial. The Spirit is not inferior to the Father, any more than the Son is, and these errors are heresy and condemned by the Church. This is, of course, extremely hard for us to comprehend, and we see it as through a glass darkly, but since the Church has declared it to us, and the Church is guided by the Spirit, we accept His word in faith. All things that the Father has are the Son’s. And … all that belongs to the Son is the father’s. Nothing then is peculiar [to any one Person] because all things are in common. For their being itself is common and equal, even though the Son receives it from the Father. So across almost all of our churches, today is Trinity Sunday. The Trinity is, of course, one of the distinctive characteristics of Christianity, and is, in fact, almost always misunderstood by others. And, in truth, it is a difficult concept for us as well. In the break up of the Roman World, in fact amongst its causes were the Goths who under Arius became again non-Christian, or at least non Orthodox, truthfully in much the same way as Unitarians and Mormons are non-Christians. We could likely say, “Close but no cigar.” But the Arian heresy led to a restatement of the faith that on Trinity Sunday is still used in the Lutheran Church. It’s pretty much the only time we read it aloud.